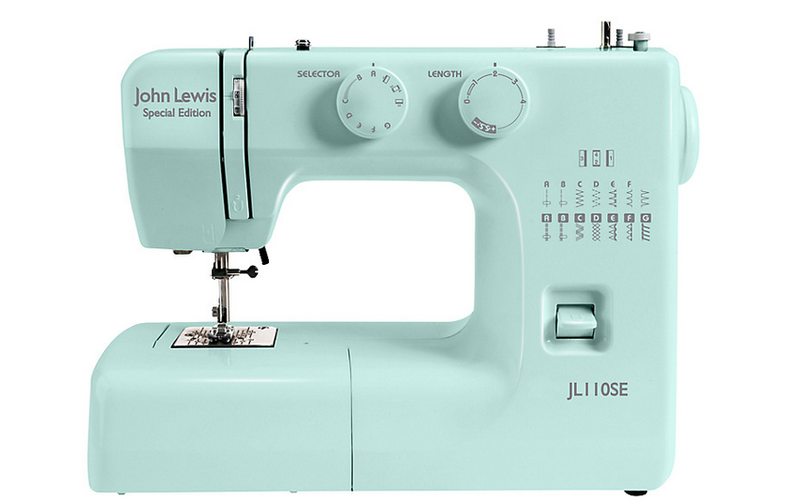 Enjoy The Minuscule: Best beginner sewing machine! Since my return from my 6 week holiday to South Africa I have been searching for what I want to do next, first I started with my blog and now I've decided to take up sewing however considering that I haven’t done any sewing since my GCSE years which was four years ago now (also the fact that I didn’t get a GCSE in it textiles proves that the experience was not exactly thrilling) I had no idea what I should be looking for in terms of a sewing machine but I went searching nonetheless and eventually came to the John Lewis website where I discovered that they had their own in house brand of sewing machines and so after much deliberation I went for the John Lewis JL110 sewing machine. For a beginner such as myself I would say that this is a brilliant sewing machine and at only £99 it’s incredibly affordable and it’s definitely the best priced sewing machine I’ve found online, I bought mine in the colour Spearmint which is exactly as the colour shown online and I ordered it with John Lewis’ click and collect service which meant that delivery was free and arrived at my local Waitrose the next day it also comes with a 2 year manufacturers guarantee which was a pretty big positive for me. Once I got it home it was very easy to set up as its very light to carry at about 6kg and the very thorough and easy to follow handbook made it a breeze to set up. It comes with 14 stitch options which I feel is probably just enough as well as a four step buttonhole facility and a free arm for when you want to sew cuffs and trouser legs, I would also like to note that as a beginner I obviously know nothing about thread tension but the handbook is so good at explaining everything and even lists what thread tension you should use for which stitch you choose. Another thing which I thought was very kind of them was a bag of extra goodies inside the machine such as 5 extra sewing needles, an unpicker and some extra bobbin cases. The only notable difficulty I had was with the bobbin case which is positioned differently to other machines I’ve used but once I got the hang of it it was a lot simpler than I initially thought, the only real problem I have with this machine is that it doesn’t have a thread cutter, which is not the biggest problem but it would be a nice feature. Here’s a summary table of what I think for those who don’t want to read my ramblings and just want to get to the point! However I haven’t had this machine for such a long time so these are only the face value pros’ and cons’ that I have found, these may change over time.